During times of crises, people want to be helpful but they don't always know how to be. It's that dilemma that Sarah addresses head-on in Alongside. Born out of her experience with how people served her while recovering from repeated back surgeries as well as the times she walked with friends facing cancer diagnoses, Alongside is filled with personal stories about what actually is and isn't helpful during times of trial. 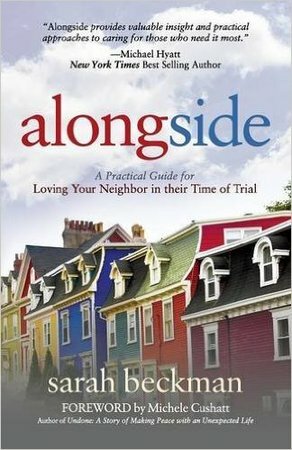 Alongside is a highly practical resource in which Sarah reminds readers to offer specific help and challenges them to help without asking, saying “some of the best help comes from people who didn't ask permission first.” Throughout Alongside, Sarah also includes several helpful lists including how to serve others when someone dies or is facing a long-term illness. My biggest critique of Alongside is Sarah's “research”. Throughout the book, Sarah refers often to the research she conducted before writing it, when she talked to others who have journeyed through crises to find out what was and wasn't helpful for them. While Sarah's research certainly wouldn't stand up to academic standards, I appreciate the fact that Sarah's advice comes from more than just her own experience. All in all, Alongside is a highly readable manual for caring for people during times of crises, informed by Sarah's Christian faith. Anyone who's ever wondered what they can do to help someone weather a time of crisis will find this book helpful, as will pastoral care teams looking for a resource to read and discuss together. Disclosure: I received a free copy of Alongside in exchange for a fair and honest review.